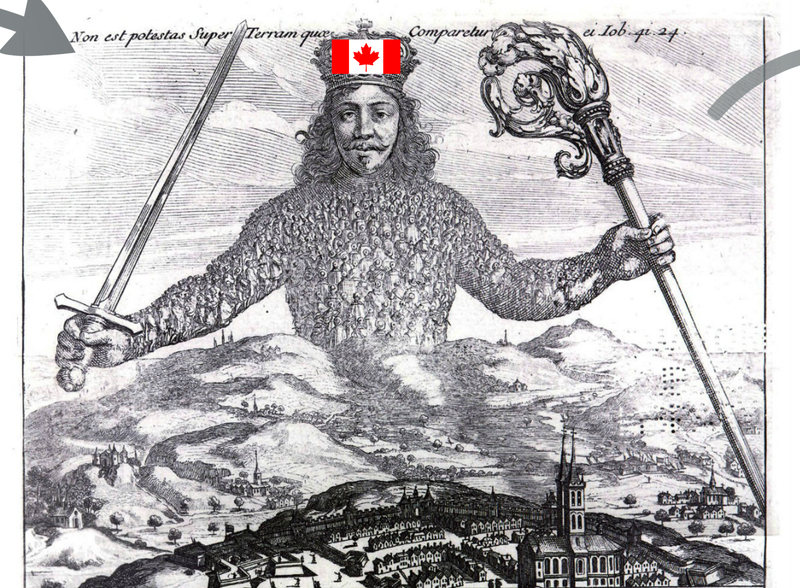 On Monday, Nov. 10, 2014, I gave a lecture on Hobbes’ Leviathan for Arts One at UBC. There is a video recording, but we don’t post those until after students have submitted their essays (so no one is tempted to skip lecture!). I’ll link to that when it’s ready. I wanted to share my presentation slides here because, as usual, I didn’t get to everything I wanted to say (it’s so hard to gauge exactly how much you can fit into a 2-hour lecture (or rather, 2 50-minute lectures!). I wanted to let students (and anyone else who is interested) get a chance to see the last few slides. Or rather, I used Prezi for the first time with this lecture. 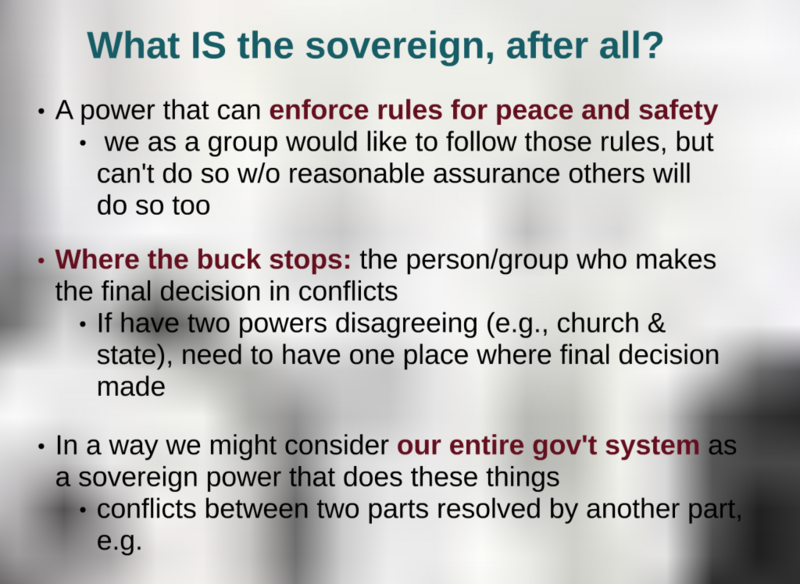 I like it because it allows you to group your slides together in ways that can show how the argument is structured. 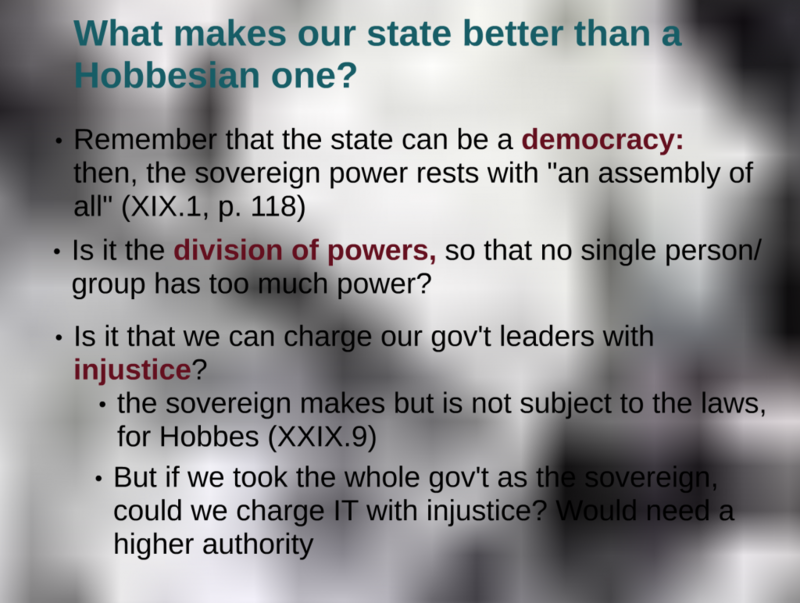 Only mine is a bit messy–what does that say about my argument in the lecture, eh? 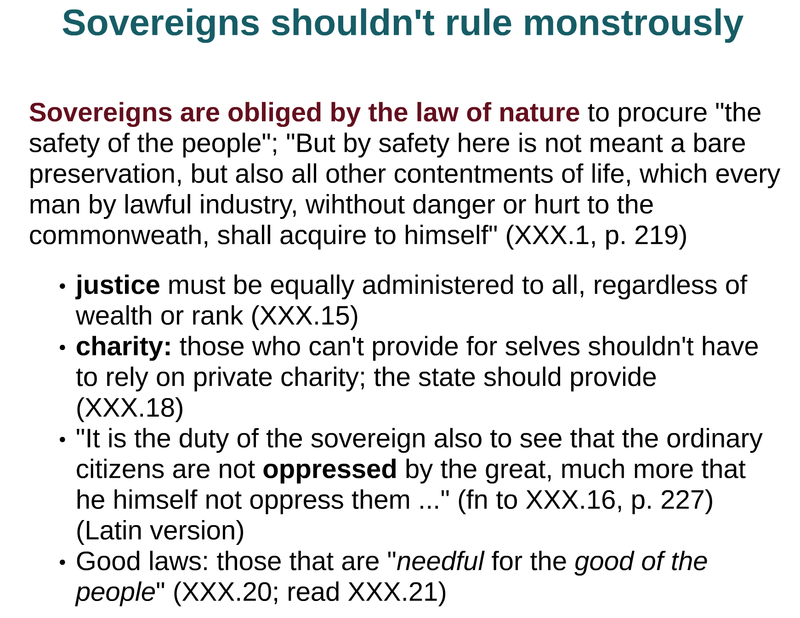 I only got to the last three slides on the bottom (the powers of the sovereign, the liberty of subjects, and what subjects can’t do). 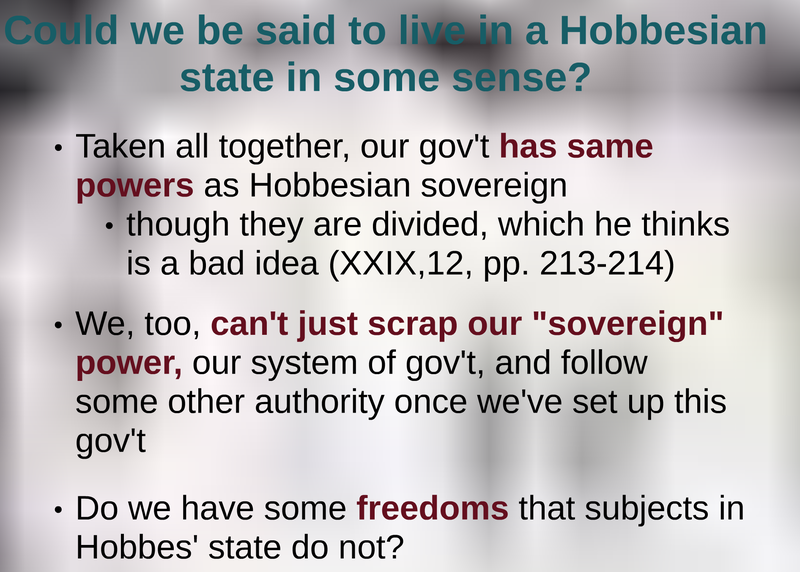 If you saw the lecture, skip past those to see what else I was trying to say, and why I was gesturing towards thinking that maybe the Hobbesian state wouldn’t be monstrous, and maybe our state shares some similarities with a Hobbesian one. Or, if you don’t want to go through the whole Prezi just to get to the last few slides, here they are (they’ll make sense, hopefully, by themselves if you saw the lecture). The last three are zoomed into the frontispiece as if we were going into the body of the commonwealth; thus the grey background! 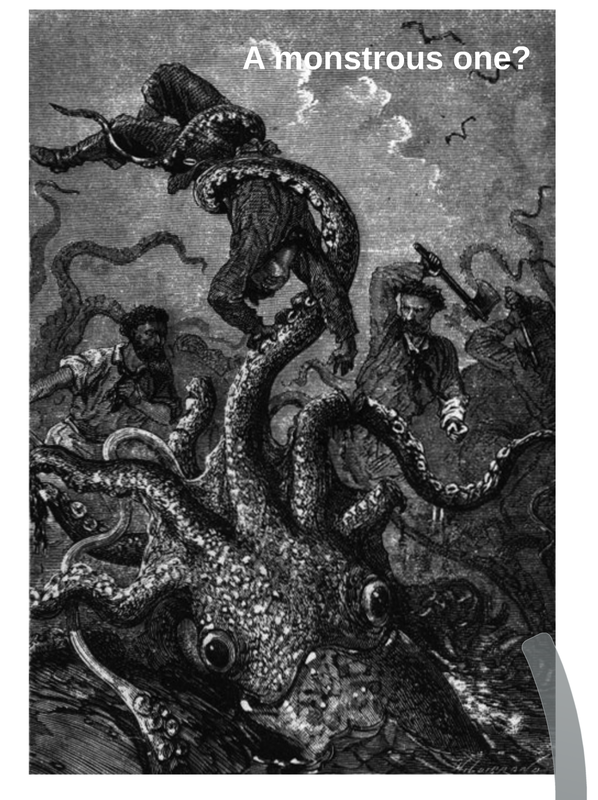 Posted in Arts One texts and tagged Arts One, Hobbes, Leviathan on November 12, 2014 by Christina Hendricks. 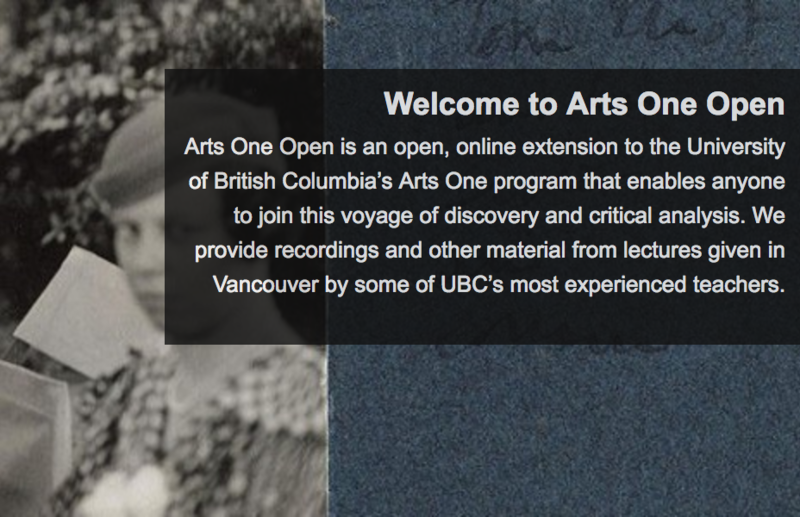 In March and April of 2012, a research assistant (an Arts One alum) and I did a survey of alumni of the Arts One program (a team-taught, interdisciplinary, year-long program for first year students at UBC). Arts One has been in existence since 1967, yet very little research has been done on how it impacts students. I hope to do some research on that broad question in the coming years. The purpose of the survey of alumni from earlier this year was to see how students themselves thought Arts One impacted them, in two ways: how it impacted their work in other courses, and how it impacted them beyond their work in other courses. Just for fun, and to see if we could isolate that which really sets the Arts One program apart from other first year programs, we also asked them what they thought the most important aspect of Arts One was (a question I had taken from an earlier study on Arts One, by Cheryl Dumaresq (see https://circle.ubc.ca/handle/2429/3693 for a copy of Dumaresq’s survey of Arts One alumni in the 1990s). We surveyed students who had just finished Arts One that Spring, plus those who had taken Arts One their first year and were still at UBC, in their second, third, fourth years and beyond. 116 students answered our email request to fill in an online survey. The questions were all open-ended and subjected to descriptive qualitative analysis only. The reason for doing this survey, beyond being interested generally, was to gain material for developing research questions to study further later. In other words, this was a pilot study to determine which areas of Arts One to subject to further research, and how/why. In what follows I begin thinking about some possible research questions arising from the data. In some ways, the results of the survey were unsurprising, in the sense that I guessed before doing the survey much of what came out of it. But there were a couple of things I hadn’t thought of before, which was the point of doing the survey in an open-ended way (so students weren’t stuck with giving only multiple-choice answers to topics we thought of ourselves). Over 90% said Arts One impacted them in ways that positively affected their work in other courses. A few said there was no impact on their work in other courses, and a few said it impacted their work negatively (though some of those also said it had some positive impacts too). Most of the respondents said it helped with writing (73% of respondents; 80% of those who said A1 had positive impact on other courses). This wasn’t surprising, as improving writing is one of the main emphases of Arts One. Students write 12 essays over the course of one year (approximately one every two weeks), and each of those essays is peer reviewed in a tutorial meeting of four students plus their professor. Every week students meet in these tutorials and discuss two essays, each for 25-30 minutes. Of those, most said it was the tutorials that helped with their writing (48%), and next highest cited was the amount of writing (39%). Some of these may be the same people (they may have said both things). What could be some reasons students think tutorials are so helpful for improving their writing? In tutorials we discuss particular issues with the papers being commented on, but also general advice about writing academic papers, about the writing process, etc. Some of this advice comes from the professors and some from the students. One thing that several students mentioned as being helpful is the chance to read and comment on others’ essays; some noted that this helped them think more critically about their own. One stated that giving comments to peers in front of the professor, and having the professor comment on those comments, was especially helpful. Students likely also feel some pressure to make their writing better because they have to present and defend it in front of peers and the professor. Revisiting work in an intensive way after it’s written may also contribute to improvement in writing. It would be interesting to see if students’ self-perceptions match up with reality: does their writing really improve after completing the program? One could compare their improvement with gains in writing skill from other first-year writing courses (though that might be difficult, as several such courses at UBC have different foci than the writing in Arts One, emphasizing research whereas we do not). I could have a look at the literature on self-perceptions of skills (esp. writing skills) and objective measures of those, to see if generally self-perceptions tend to be accurate or not. I recall reading something about this somewhere, but I don’t have the details ready to hand. I could focus on and expand upon the above questions about tutorials: what it is about tutorials leads students to cite them as particularly helpful for improving their writing skills? 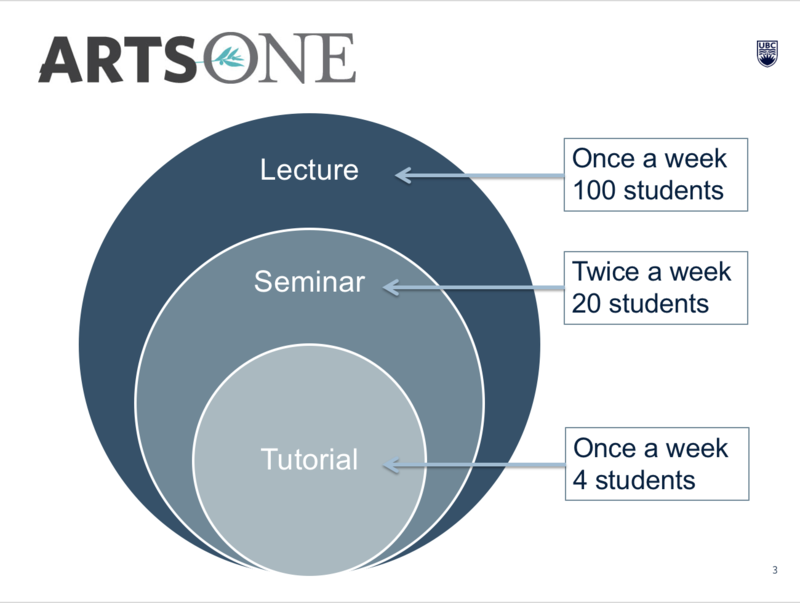 Is there something special about A1 tutorials, as opposed to peer review in other courses? E.g., I do peer review in other courses, and get no such comments about its value, even though the peer review is done in small groups during class time, as with the Arts One tutorials. Peer review does not constitute a separate class period in those other courses, though, like it does in Arts One, and I as the professor am not sitting there with the group the whole time they are doing the peer review. Is there something special about having the prof present the whole time? Is there something special about the amount of time spent on each essay? Is it that it is done every single week? Does the fact that it’s a scheduled part of the course, so especially emphasized, make a difference? Is it perhaps that students recognize that tutorials are supposed to help them with writing, so they think and say that they do? After all, one wouldn’t want to spend so much time doing tutorial work for nothing. I’m not sure how to even begin to answer any of those questions yet! A significant number of students said Arts One contributed to their critical thinking skills (24% of respondents, 27% of those who said A1 had a positive impact on their other coursework). I expected this to show up in the survey, as one of the things we emphasize in Arts One is providing students with a lot of opportunity to develop their own responses and arguments to the texts and issues we discuss. The seminars are focused on discussion, and many of us try to get the students to lead that discussion as much as possible (with some variation for professor style, of course) and though we provide essay topics for the papers, they are purposefully open-ended so that students have a lot of room to argue for their own readings and emphasize what they find important. However, the survey responses did not provide much clarity as to what aspects of the program especially helped with critical thinking, in the students’ views. Many of those who said A1 helped with critical thinking did not explain clearly how, and among those that did, numerous aspects were cited such that I couldn’t find a clear pattern for which things were most helpful. Studying what critical thinking is, and how to promote it, is an entire field in its own right. There are numerous definitions of critical thinking, and quite a few different tests of it, and I would need to delve into that literature before even beginning to think further about this topic. It’s unclear what each student meant by terms like “critical thinking,” or “analysis skills” when they said them, as well. One thing I am particularly interested in myself is perhaps captured by the term “critical thinking,” but perhaps not–it’s the ability and confidence to engage in independent thinking. I think what I mean by that term is that students feel they can sit down with a text and make sense of it on their own, or with a small group of peers, without needing to rely on finding out what others (experts) have said about it in order to find out what is the “right” way to read the text. We specifically and consciously downplay seeking outside research on the texts we read, so as to focus students’ attention on their own reading and analysis skills. I, personally, also emphasize that the idea in writing essays for Arts One is less a matter of getting something right about the text than it is about coming up with a thought-provoking, justified reading, an interpretation grounded in the text but that also goes beyond a surface level and can make the reader really think. 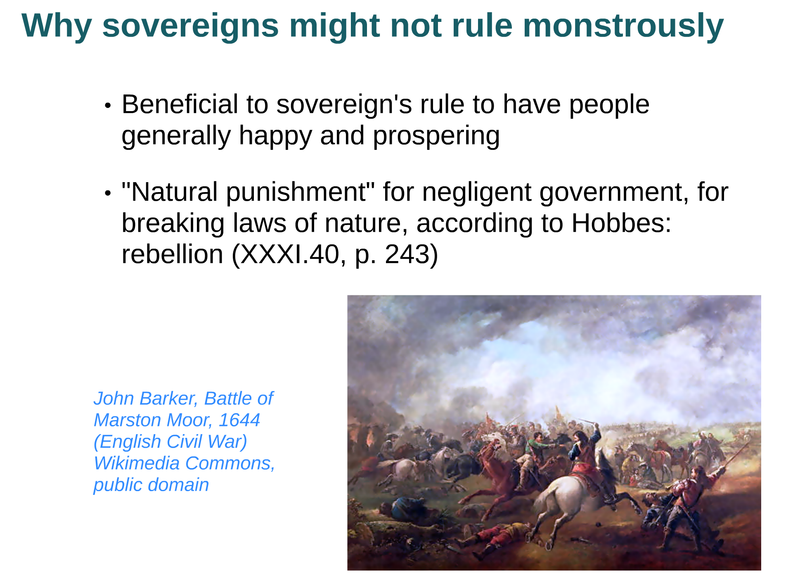 I am hoping students take risks rather than provide just the safest or most clear-cut arguments possible. 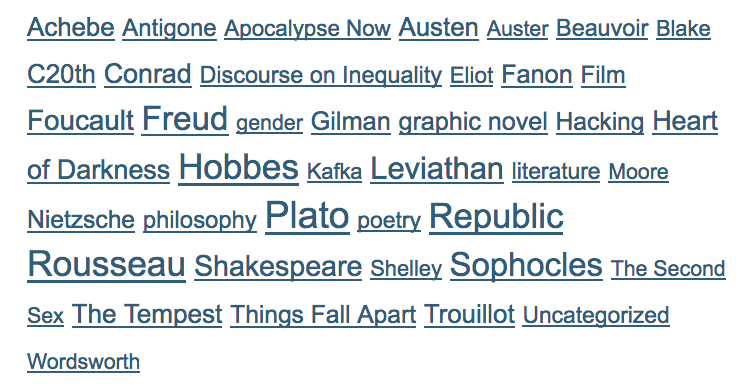 I would need to better clarify just what I am looking for here, and what terms that corresponds to in the literature. The same number of students as said Arts One helped critical thinking said it helped their confidence in some way, such as confidence speaking in class, speaking to profs, confidence in their writing skills, or in their own ideas as valuable (24% of respondents, 27% of those who said positive impact). I find this one especially interesting, perhaps because I hadn’t really thought about it before, and yet it is so important to students’ future coursework and life. My rough analysis of the survey data has not yet revealed clear patterns on how, exactly, students think Arts One helps with their confidence, which aspects do so and why. I plan to go back over the data and see if I can come up with something clearer on this, or if the answers are simply too thinly scattered. Maybe something in the area of confidence would be a better place for me to focus my attention to try to capture what I was talking about at the end of the discussion on critical thinking. If students feel confident in their own ideas and their ability to express and defend them, they might be more likely to approach texts and discussions in the way I suggested. Studying confidence has the added bonus of being easier to study than whether writing really improves or whether critical thinking really improves, because one would, presumably, rely on students’ own self-reports of confidence. Though I suppose that some behavioural data might contribute to showing increases or decreases in confidence as well. There must be literature on levels of confidence and how this affects students’ coursework…I would need to look into that. 83% of students said that Arts One impacted them positively in ways beyond their work in other courses. Most of those who did not assent to this simply said it did not impact them beyond coursework. Only two gave negative comments in response to this question, and only one of those was about the program itself. The most often-cited answer to this question from students was that Arts One provided a close-knit community that allowed them to develop friendships, get to know their colleagues and the professor, and feel comfortable in the classroom (38% of respondents, 46% of those who said Arts One impacted them in some positive way beyond their work in other courses). I guessed beforehand that this would be important, as it’s something else that we emphasize in Arts One. There are five professors who team-teach the course (two groups of five profs total, with separate themes, readings, and students); there are up to 100 students in the course and each professor is assigned to up to 20 of those. 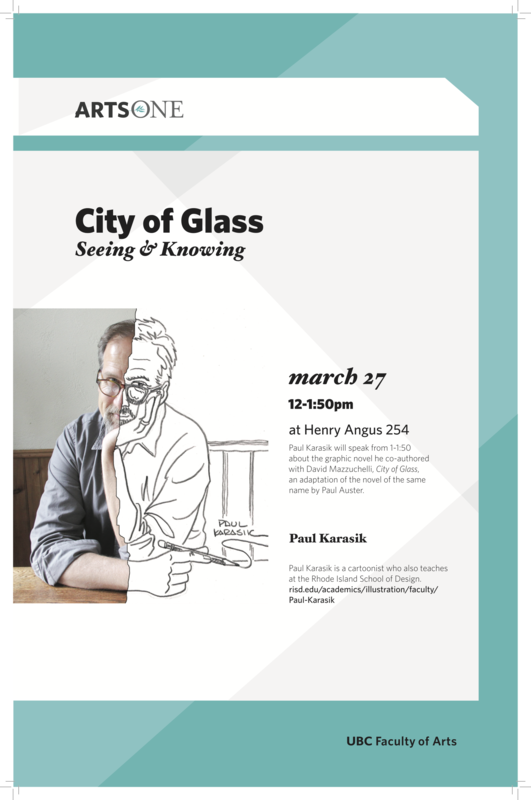 Each week there is a lecture given by one of the five professors to all 100 students, and two seminar discussions of 20 students with their professor. Then there are tutorials of four students from the group of 20 with their professor, and each student has one of these per week (each prof has five). The students in the seminar group of 20 get to know each other and their professor very well, with two discussions per week plus a tutorial every week. They often get together outside of class for study or social purposes, develop group Facebook pages, etc. The seminars were cited as more important for developing a sense of community and friendships (25% of respondents, 30% of those who said A1 had positive impact beyond coursework) than tutorials (14% of respondents, 17% of those who said positive impact). I suppose this could be a little surprising, since the tutorials are only 4 students plus the professor, while the seminars are 20 students plus the professor. But the tutorials are somewhat stressful for numerous students, as it is where they have to present and defend their essays, listening to and responding to criticism from their peers and professor. They also have to learn to constructively comment on the essays of their peers, which can be difficult for many at first. Though by the end of the year the tutorials are often much more relaxed, I am not surprised that students don’t view tutorials as being as much of a space for developing a close sense of community and friendships as seminars, overall. It might seem, and many students thought of it this way, that developing a sense of community and having friendships come out of Arts One is mainly a social effect that doesn’t have much to do with academic coursework. But I think that’s a mistake. I know I have read some things that point to the importance of having a close community and friendships in courses, and it would be good to revisit those to show that this could be an important ingredient to student success in Arts One. If students see the value of developing an academic and social community in their classes through their Arts One experience, it might encourage them to seek to develop those in other courses as well (as a few students mentioned in their answers to the survey). So looking at the literature on community and student success (broadly defined) would be a good place to start. Then I might be able to find best practices on developing a sense of community and see if they are implemented in Arts One. Or see if some aspects of Arts One are especially important to developing a sense of community that might be exported to other courses. A significant number of students pointed out that Arts One had improved their confidence in ways that extended beyond their work in university courses, such as confidence in public speaking, in their own views, and in writing (13% of respondents, 16% of those who said A1 had positive impact beyond coursework). This is less than the number who pointed to confidence in response to how Arts One had impacted their work in other courses, but presumably if it gave them confidence in the above ways for courses, most of that would transfer to their life beyond the university. possible research areas: Same as above re: confidence, but it’s important to think about the value of confidence beyond how it can help students succeed in their university coursework. Most often cited as an answer to this question was having small classes (35% of respondents). A close second were seminars and tutorials, which had about the same number of people citing them in answer to this question (31% of respondents said something about seminars in response to this question, and 32% said something about tutorials). The next highest category was people who said something relating to the quality of the professors, a particular professor, or the lectures given by professors (26% of respondents). Finally, a significant number of people said the most important thing was the ability to have close connections between students and professors (19%). This, of course, is closely connected to having small classes (though small classes are not required for it, they can help facilitate it). The 4-person tutorials are especially conducive to students being able to work closely with professors, and to gain confidence in speaking to them. 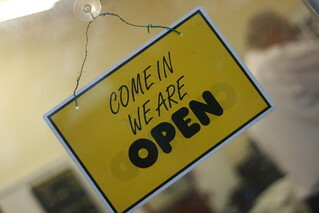 Many of the above are related–small classes (seminars and tutorials) and the ability to have a close connection between students and professors. Why is it that connecting with one’s professor is so important? What does it facilitate that being an anonymous face in a classroom where one never speaks to the professor does not? Does the fact that Arts One does not have any Teaching Assistants have a bearing on these issues, or would a close connection to Teaching Assistants yield similar results? There is much to think about here. Obviously I’ve raised enough research areas to last a lifetime. I just need to pick the one I’d like to work on for the next few years…a daunting task! Posted in peer assessment & feedback, Scholarship of Teaching and Learning and tagged Arts One, student writing on October 25, 2012 by Christina Hendricks.